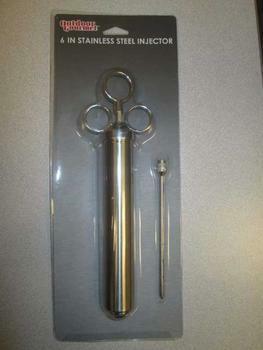 Academy Sports + Outdoors of Katy, Texas, is recalling about 3,500 Outdoor Gourmet marinade injectors. The injectors can have small metal shavings left inside during the manufacturing process. The metal shavings can be deposited into the marinade during use and ingested by consumers. The company has received one report of small metal shavings coming out of the product on first use. No injuries have been reported. The injectors, manufactured in China, were sold exclusively at Academy Sports + Outdoors stores nationwide and online at www.academy.com from September 2015, through December 2015, for about $20. Consumers may contact Academy Sports + Outdoors toll-free at 888-922-2336 from 7 a.m. to 12 a.m. (CT), by email at customerservice@academy.com, or online at http://content.academy.com/recalls/Academy%20Outdoor%20Gourmet%20Marinade%20Injector_%20CPSC%20Recall%20Poster_4.14.16.pdf for more information.